Reports allege that Israeli warplanes carried out a mission over Lebanon, amid concerns over chemical weapons. 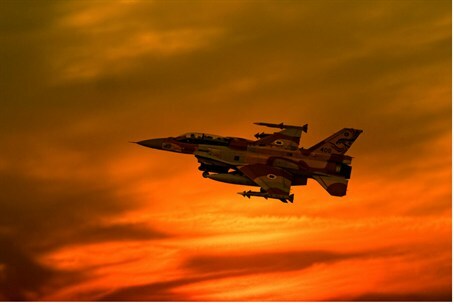 According to reports, Israeli warplanes carried out a surveillance mission over Lebanon Tuesday night which possibly included a strike on an alleged weapons convoy located near the Syrian-Lebanon border. Lebanese news agencies claimed that the Lebanese Army spotted the Israeli warplanes immediately and closely monitored their flight path. According to a statement by the Lebanese army, four Israeli Air Force planes entered Lebanese air space at 4:30 p.m. These planes were replaced four hours later by another group of planes. At 2 a.m. the second group was replaced by more Israeli airplanes, and the mission finally came to an end at 7:55 a.m.
As reports of the planes flying over Lebanese airspace began to surface, a western diplomat, speaking on the condition of anonymity, alleged that the mission was not limited to surveillance but also included an attack on a weapons convoy on the Syrian-Lebanese border. "There was definitely a hit in the border area," the source told Reuters. The IDF has declined to comment and the validity of the reports cannot be verified however they are of particular significance in light of Israeli concern over chemical weapons in Syria and Lebanon. On Sunday, Israel deployed two Iron Dome batteries in the north of the country, but the IDF refused to clarify if the deployment was part of routine tests or a necessary precaution to possible threats of Lebanese and Syrian weapons aimed at Israel. The news site Al-Monitor also reported that IDF intelligence chief Maj. Gen. Aviv Kochavi was in Washington on Tuesday and took part in closed-door meeting with U.S. security officials, however, Israeli officials refused to comment on the nature of the meetings.